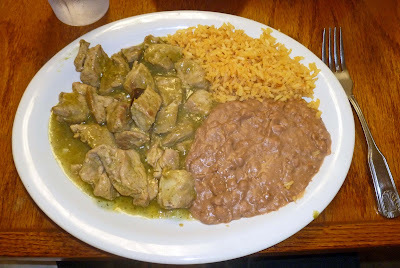 Every couple of weeks a whistle sounds in the chileverde craving section of the ‘Mad Meat Genius’ mind. This itch needs to be scratched and Otaez in Oakland California will provide the meal to whet my appetite. 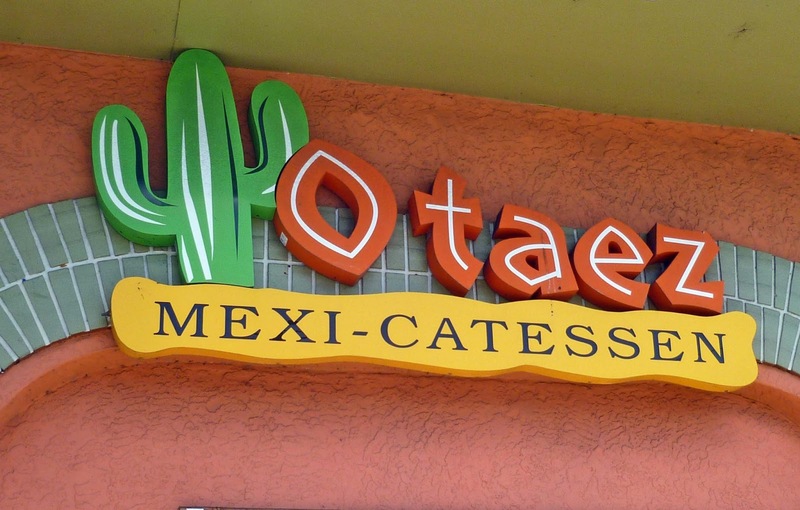 Previously we visited Otaez’s sister restaurant located in Alameda. If memory serves me right this meal was very satisfying. Let’s pull up a tortilla chip and dip into the salsa of our noon time nosh. We are no strangers to this establishment. I have been gong to this restaurant as far back as the eighties. It is located in a colorful urban neighborhood with many choices of Mexican restaurants nearby. Otaez is a poplar choice for many of the members of the ‘Men in Blue’. The outside walls are peppered with colorful murals depicting Mexican folk scenes. Through the doors reveal a huge dining area with plenty of booths and tables. More folk art murals decorate the walls. We receive chips and salsa immediately. Ms. Goofy and I are like a broken record when it comes to ordering. 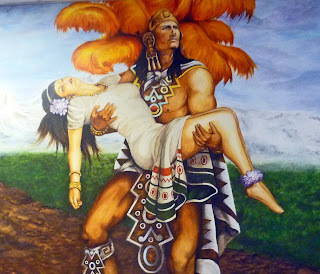 Chile Colorado burrito for Ms. Goofy and Chileverde for the meat freak goes the tune. This is comfort food that we crave. The chileverde is the same recipe as the Alameda branch. The house made tortillas are a wonderful treat in my book. Ms. Goofy’s burrito was slathered in a red mole sauce that was spectacular. It had a hint of chocolate in its chile splendor. 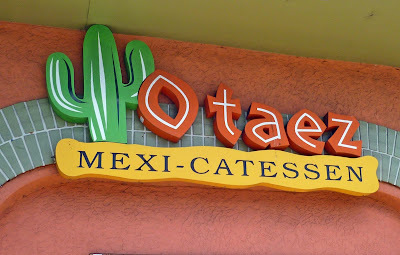 There is a reason we have been returning to this restaurant and may I suggest that you come visit Otaez and find out for yourself. Wow, that's an enthusiastic endorsement from you. Must try! There are many good Mexican restaurants all in this area. I have been going to Otaez for a long time. Oh, it looks really good! Hmm. I hear they have these things nowadays called, what, cars? That plate should put a dent in your appetite! I've been going to the original Otaez since moving here 14 years ago. I find a big dropoff in quality at the Alameda location. Lori prefers going there because she likes the set-up better (and I'll admit watching baseball is better in the bar there) but after our last visit even she agreed to implementation of our new original-Otaez-only. Maybe it's the same recipe but executed poorly in Alameda; maybe they're catering to a different audience. cookiecrumb, Let us know if you ever leave the castle and we will break tortillas with you. Greg, With the house made tortillas it is a very filling meal. Very inexpensive too. Three Dogs BBQ, It is always a treat for us. Aaron, I like Alameda because of the bar with Negra Modela on tap. The original has that old school feeling. You must go to La Estrellitas my all time favorite. East 12 and 5th St. I just love the name, I've only been there for breakfast, the chile verde looks worth going back for. How are the frijoles? Hello Sandy Waddle, It is funny that you mention the re-fried beans. Ms.
Goofy is a magical fruit connoisseur. She loves the frijoles. She is not 100 percent positive but these may be flavored with beautiful lard. She even ate the my beans. Truth. 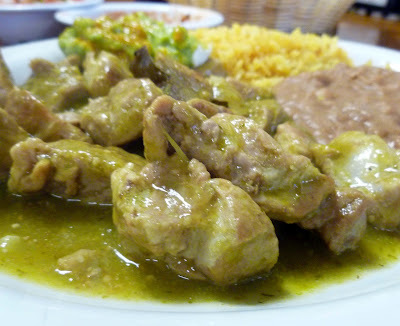 My stomach should be satisfied with the smoked chicken that I am about to enjoy but now my appetite is craving this chile verde. Dang you!